If you haven't discovered the wonders that are Turmeric you are surely missing out. Originating in India more than 2,000 years ago, turmeric is prized for its anti-inflammatory properties and is currently being hailed as a treatment for a slew of inflammation-based illnesses including Alzheimer's and cancer. Turmeric is a key element in my alternative treatment program for rheumatoid arthritis. Everyday I take the supercritical extract in capsule form, I drink home-brewed turmeric tea and I juice it. It's my secret weapon. 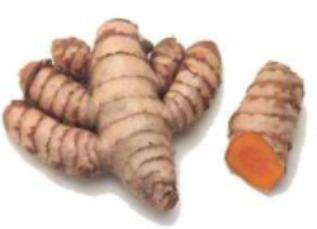 Similar in appearance to ginger, turmeric is a bright orange, segmented root that should be peeled before use. The fresh root is wonderfully aromatic and quite potent in flavor. Its brilliant color will briefly stain your fingers and cutting board, but that's a small price to pay for this natural wonder. This is a potent brew. You may want to start by using a smaller amount of turmeric and ginger in your tea, and work up to the full amount, or just dilute the finished tea to a strength you enjoy. The exact measurements here are not important so brew at a strength you can enjoy at least twice a day. I drink 8oz to 16oz a day. Combine all the ingredients in a large pot. Bring to a boil and remove from the heat, allowing to sit and steep for 30 minutes. Strain and store in the refrigerator. Serve hot or cold. Posted on May 10, 2013 by Catherine Ruehle.